The idea behind the house on Balcones Drive was good, but at 2640 sq ft, it was tight on square footage and lacked much needed storage, a full utility room, and an updated master bedroom and bathroom the owners could truly enjoy. The project was broken into two phases, the first was to update finishes throughout the house and separate the a/c system into two separate units for each end of the house, and the second entailed the complete remodel and 560 sq ft addition to the north end of the home to expand the master bath and add a home office, utility room, and storage rooms to the existing garage. 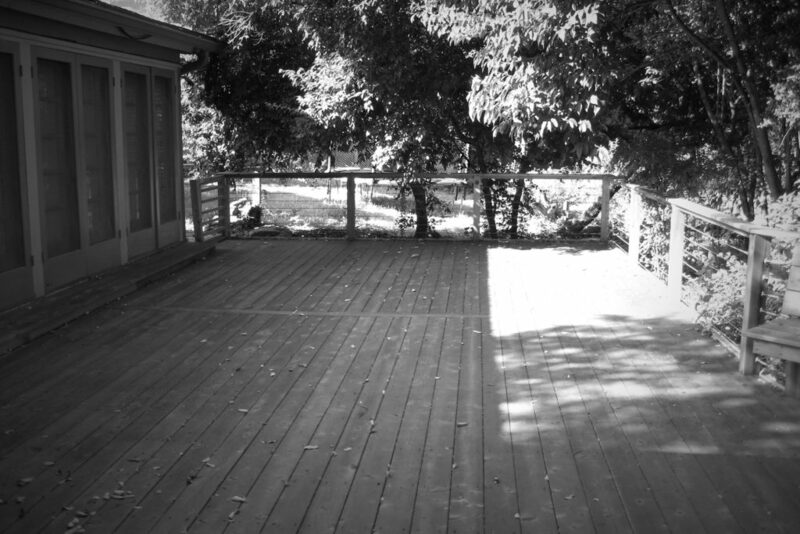 Losing the garage meant the need for a new carport and driveway approach that consisted of a new salt-finished circle concrete drive that would allow guests to park off the busy street. To do this meant weeks of jack hammering the native limestone to carve out an area on this sloping lot, and lay pipe to correct the drainage problem that existed once the retaining wall was installed. By removing the washer/dryer (that consisted of a stacked unit from the kitchen) a full utility room with built-in pantry, wash sink, extra refrigerator, and work area were added in the garage, leaving a place in the kitchen for a full size wine fridge that fit in the space vacated by the stackable washer dryer. The low slope of the house’s roof left no attic access for storage, so two new walk-in storage closets were added to accommodate seasonal and travel storage, as well as create a small play room nook for the couple’s grandchild to play closeby while grandmother works in the utility room. 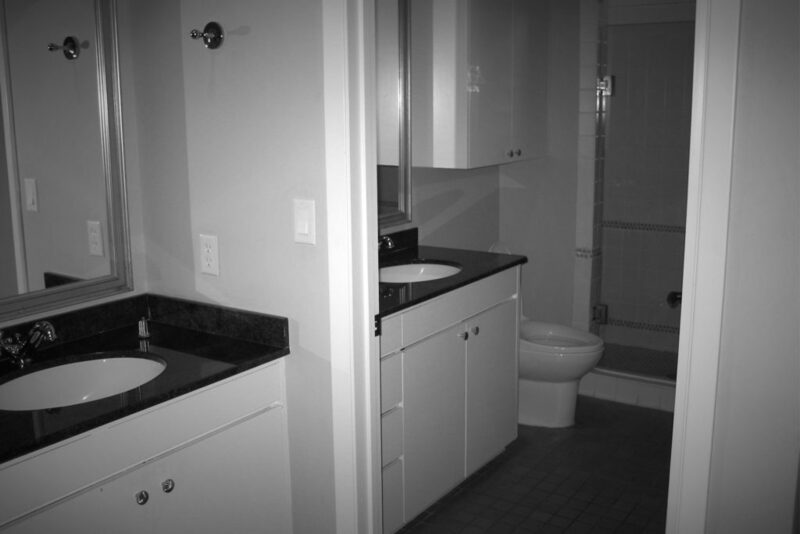 The existing master bath was functional but by no means a place of relaxation. Opening directly into the bedroom, the 5-foot wide by 16-foot deep tunnel was shifted to take in the remaining area of the garage and expanded to create a new 7-foot x 8-foot walk-in closet, and wide open 8-foot x 16-foot bathroom. With closed off potty room, walk-in shower, and relaxing soaking tub under high transom windows that allows outside light as well as views of the nearby trees in to the space. With clean lines and smooth honed travertine floors and wall tile, this elegant bathroom completed the addition in relaxation and style. Directly outside the master bedroom and living room sits the real charm of this project on Balcones Drive. 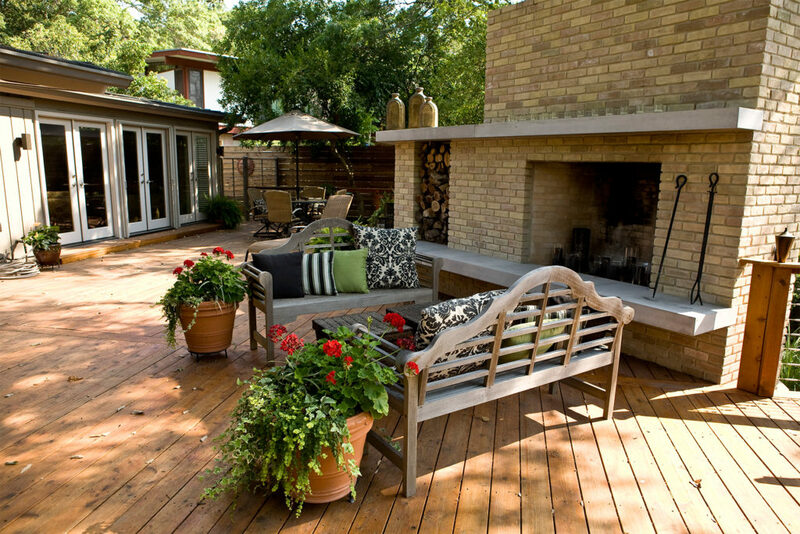 Once just a rotting wooden deck now lies an outdoor retreat complete with a custom fireplace, designed by Realty Restoration. Made of brick and massive floating slabs of concrete for the hearth and mantel, continuing the house’s linear theme, this fireplace was designed in 3-dimension to help the client visualize what the final project would be, and then built to exact dimensions. Leaving nothing undone, a unique storage space was designed in conjunction with the fireplace to keep wood dry and readily available. The direct relationship of this expansive patio to the house and the series of French doors in both the master bedroom and living room, allows these rooms to be transformed into a continuation of the outdoors. Where once a backyard was just leftover undeveloped space on this sloping lot, now a flat landscaped retreat extends the usable area of the lot, allowing one to relax in the lush green grass, or watch the client’s grandchild play in the nearby playscape.